This weekend I went to the San Francisco Map Fair, a delightful exhibition of mostly antique maps. My eye was caught by an unusual map of the world centered on a northern point quite near the North Pole, with North America, Europe and Asia splayed out in a circle around it. There was a thin, dark band running a wavy course across the map, from the East coast of North America across the Atlantic, through Europe, down the Arabian peninsula, and ending in what is marked on the map as Ceylon. Around the edges of the map are various circles with crescents. It was an eclipse map… from 1748. With eclipses still on my brain from the Great American Eclipse last month, and encouraged by my amazing wife, I bought it. I spent some time this afternoon poring over it and researching its background. The main question in my mind was, how did they predict eclipses in this much detail using 18th-century technology? But this involves untold numbers of multiplications and additions (millions? billions? ), to many decimal places. Surely this can’t be how astronomers did it before computers. Yet, here we are with detailed eclipse predictions, seemingly down to the arcminute, in 1748. An afternoon of online research was only moderately enlightening. Rough predictions of eclipses have been made for millenia. Multiple ancient civilizations from the Babylonians to the Chinese kept detailed records of eclipses. From centuries of records, patterns emerged, most notably the Saros cycle: the Sun, Moon and Earth return to approximately the same relative positions on a period of just over 18 years. This allows you to predict the date and time of eclipses based on past observations. Indeed, Columbus used this level of prediction in 1504 to convince the Arawak natives he was butting heads with that his god was angry with them, thus resolving the conflict and laying the seeds of a plot device that would be used in A Connecticut Yankee in King Arthur’s Court and countless other hackneyed stories. The date and time are all you need for a lunar eclipse, which can be seen at the same time by everyone who can see the Moon. But a solar eclipse looks different from different points on Earth, and totality (when it occurs) can only be seen from within a narrow band. For centuries, it was possible to predict when a solar eclipse would happen, but not where you’d be able to see it from. How exactly these calculations were made, I’m a bit fuzzy on. From what I can piece together, they were done with a series of approximations. The ancient Greeks had a few terms of the series. Tycho Brahe and Kepler added a few more. By around 1650 the first eclipse map was made. Newton’s theory helped. In the Principia (published in 1687) he applied the idea of universal gravitation to explain how the Sun pulls on the Earth and Moon unequally and how this perturbs the Moon’s orbit. Somehow, through calculations that are too complicated for me to follow, he was able to use this to better predict the Moon’s position. Again, this seems to have been done through a series of approximations (and not, at any rate, through direct simulation). 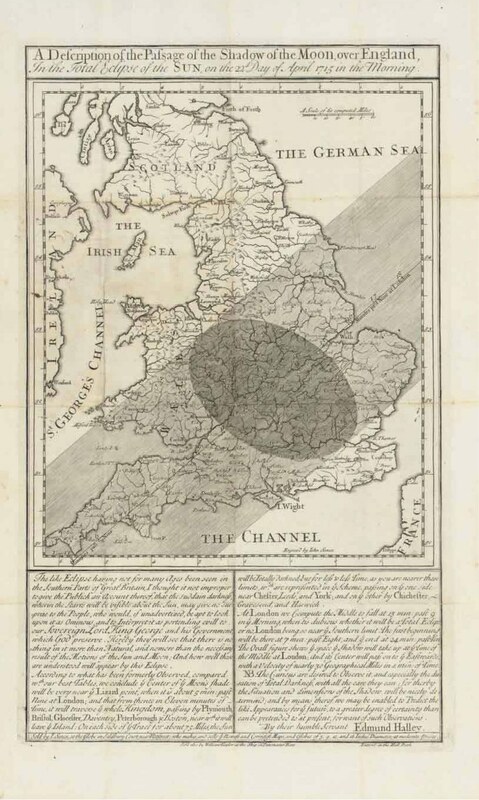 In 1715, Edmond Halley (who would later become famous for predicting the return of the comet named after him) used Newton’s theory to make a map of an eclipse that was due to pass over London. The like Eclipse having not for many ages been seen in the Southern Parts of Great Britain, I thought it not improper to give the Publick an Account thereof, that the sudden darkness, wherein the Starrs will be visible about the Sun, may give no surprize to the People, who would, if unadvertized, be apt to look upon it as Ominous, and to interpret it as portending evill to our Sovereign Lord King George and his Government, which God preserve. Hereby they will see that there is nothing in it more than Natural, and no more than the necessary result of the Motions of the Sun and Moon; And how well those are understood will appear by this Eclipse. Halley put out a plea to the public for observational data (an early instance of “citizen science” presaging the modern era of amateur astronomers sharing observations with academics?) He was off by only 4 minutes and 20 miles. The map I found at the fair was published in 1748, by which time eclipse maps were apparently a thing. Unlike Halley’s simple map focused on England, it shows the full path of the eclipse across much of the world, including the initial and final locations of the penumbra, and the degree of the eclipse as seen from various cities. 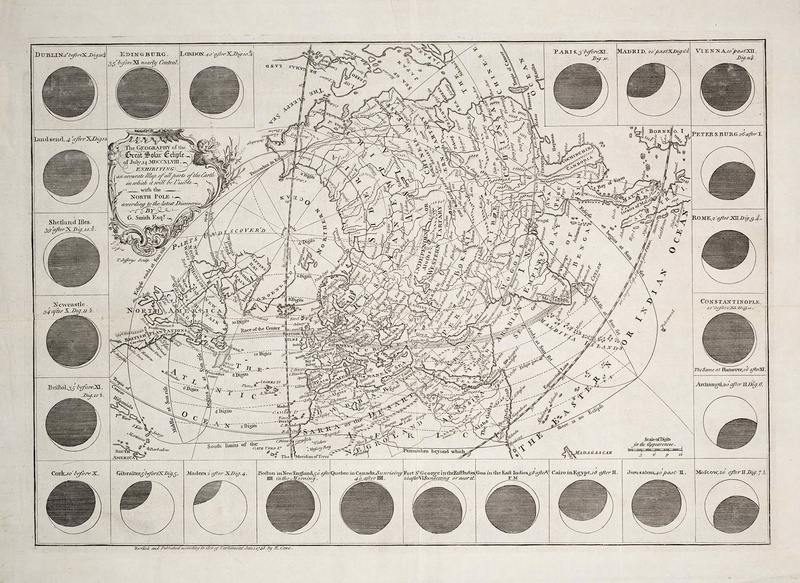 It, and other eclipse maps over the years, were published in Gentleman’s Magazine (an early periodical that covered a broad variety of topics for the educated public, and that for a time was employer to Samuel Johnson). It’s amazing to me how much people were able to do, by hand—not only in predicting the eclipse but in creating a map like this. And it’s fascinating to see the spirit of the Enlightenment developing through events like these, as the general public took an interest in science and Newton’s theory showed the world that the universe is governed by natural laws which we can learn and master—a crucial development in the idea of progress. Much more info is available at eclipse-maps.com (where I took the Halley map from); see also interesting articles from Atlas Obscura, Quartz, The Guardian, and Popular Science.